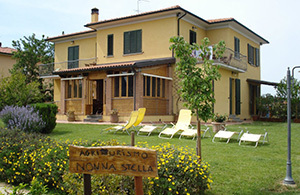 The agriturismo (farmhouse) is just four kilometers from the sea, here you can enjoy the view of the hills and medieval villages and there is a pleasant climate throughout the year. 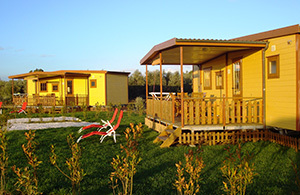 A quiet and relaxing place for a holiday in Tuscany, close to the sea and in direct contact with the life and work in the fields. The Agricamping is fully immersed in the surrounding landscape, with large grassy pitches separated by hedges of laurel. They are all equipped with electricity and water, and are divided into two types: “Standard” and “Superior”. 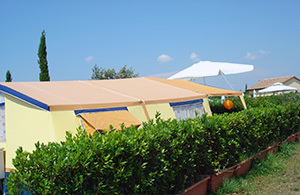 Both types are ideal for tents, campers and caravans, all just a few meters from the pool. On the same site just a stone throw away from the Agricamping lies the holiday village. Here are comfortable wooden mobile homes with a porch, garden and private parking. At about 80 meters you will find the swimming pool and baby pool with sun terrace. In the village there is also a small bar / shop, accessible to all guests. At our farm we produce fruits and vegetables of the season, that can be picked by our guests free of charge and can be consumed on the spot. We also have 800 olive trees which deliveres an extra virgin olive oil of excellent quality and is always available in the kitchen for the guests (at the farm). The swimming pool and splash pool are located in the center of the Agricamping, surrounded by a large green garden. There is a sun terrace with sun beds, umbrellas, tables, benches and canopies. A few dozen meters from the pool is a football field, a volleyball court and a “jeu de boules” court. Do not leave home without an important part of your family! Pets are welcome at “Nonna Stella”. Take them with you and enjoy together a wonderful holiday. This very favorable and strategic location, combined with a pleasant climate throughout the year allows us, in addition to peace and relaxation typical of country life, also to offer entertainment, excursions, wine tours and cultural tours. The sea and pinewoods of Marina di Bibbona are just 4 km away and are also easily reached by car or by bike (bikes can be hired from us for free).